Do you want to keep an eye on whether your home is safe and healthy? Then the Healthy Home Coach can help you with this. He measures air humidity, air quality, noise an temperature. If the measured values are not safe, you will receive a message on your free app immediately. 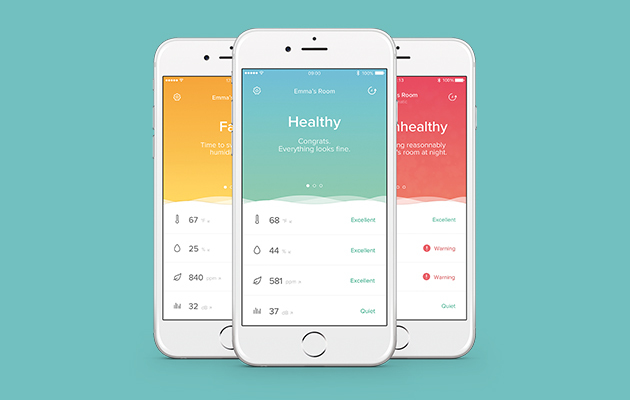 This app will tell you what values are dangerous for your health. He also will send you a solution for this problem. A poorly ventilated raam can cause loss of concentration. This is not the intention if your son or daughter is doing homework, learning for an exam or if you work at home. Small children can regulate temperature badly. If a room feels good to you, that does not mean that it feels good for a child. Your child may wake up after a nap complety drenched in sweat, while you tought the temperature was pleasant. The Healthy Home Coach advises you on wich temperature is the best. Your night's sleep may be disturbed by sounds that you did not even know you heard them. With the Healthy Home Coach, you can check your sleep time data of your entire family. This gives you insight how to improve your night's sleep. It is also possible to connect multiple Healthy Home Coaches. So you can see the values of your entire home. This allows you to measure the temperature and the noise in the room of the child, so the child can have the best night's rest possible. If you have been sleeping poorly for a couple of days, the Healthy Home Coach is likely to come up with a sollution. Or do you want to prevent your kitchen from becoming a sauna, the Healthy Home Coach has already detected this before you can feel it. And all the information is easy to read from the free app.